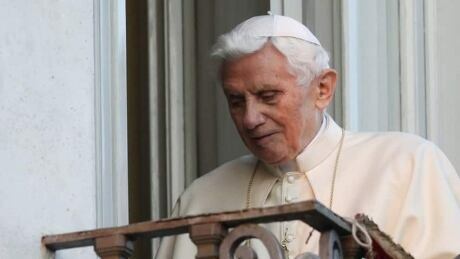 Pope Benedict speaking from the window at Castel Gandolfo, 28 February 2013. A pilgrim seeks God by leaving his home and, like Abram of the Old Testament, “going to the land I [the Lord] will show you.” After decades as a scholar, he was called to be a bishop, then to the Congregation for the Doctrine of the Faith. Just as he reached the age of retirement, and was speaking openly of retiring to a life of study and writing, he was called to be Pope. Who can imagine the discernment and prayer through which he heard the call to leave yet again and enter the “last part of the journey” on a path that is essentially undefined? The Catechism of the Catholic Church calls us a pilgrim Church on earth, a not-yet Church seeking to grow into the holiness to which we are called. After decades at the CDF, where he handled so many cases of terrible human failure and tragic harm to others, and years in the Vatican where he saw both the best and the worst of the Church, his prayer comes from a heart and a knowledge that is unique. Perhaps this year of reform and freshness that so many see in Pope Francis is also the fruit of the prayer of his predecessor. On this anniversary of his departure, I wish him well – and hope that he continues to pray for this pilgrim Church.